You know about Tex-Mex -- it's that yellow cheese-covered goodness you have weirdly vivid daydreams about that's served up in the forms of burritos, nachos, enchiladas, and chili con carne. 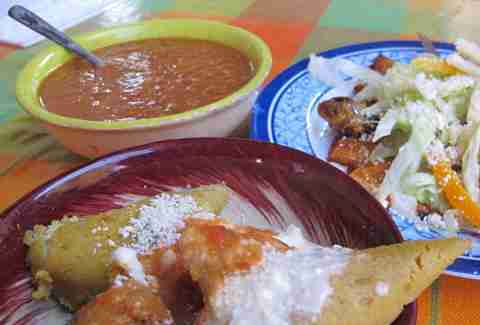 But a lot of these dishes are completely foreign to folks down in Mexico, who gorge themselves on a different smorgasbord of cheesy, tortilla-wrapped delights. We dug up eight essential, authentic Mexican dishes (with the help of chef Rick Lopez of Austin's La Condesa) that you'll wish you could find at your local taqueria/Chili's. What it is: Wait... that's a quesadilla, right? You're on the right track -- it's actually a sincronizada, which is eerily similar to a quesadilla except for a few key differences: It's usually made of corn masa tortillas rather than the more Tex-Mex quesadillas, which're made with flour tortillas. 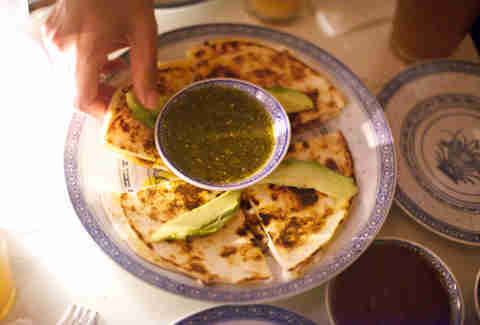 And sincronizadas often contain ham, whereas quesadillas more often contain beef or chicken, or just plain ol' queso. 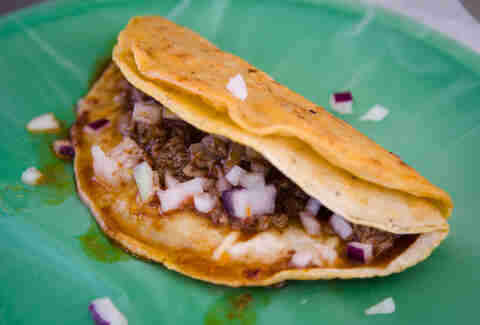 What it is: Huaraches are a type of Mexican sandal. But they're also delicious in food form! 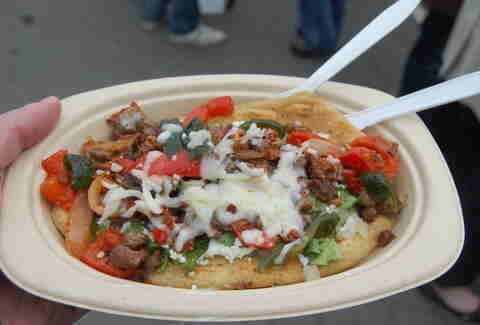 The eponymous food is an oval-shaped (read: it looks like a shoe) fried tortilla topped with salsas, vegetables, meat, and queso fresco. Their closest edible relative is the sope, which is slightly more well-known in America, and is totally not what Mexican Tyler Durden makes. What it is: These triangular suckers are pretty similar to your garden-variety tamale (those grow in gardens, right? ), in that they're made of corn leaves (not husks) that're wrapped around a filling -- in this case, it's boiled masa popped out of the leaf before being eaten with salsa and other accoutrements. They're occasionally eaten in soup with cheese. What it is: Kind of like ancient enchiladas, papadzules date back to Mayan times, when their recipe was originally developed to include thick tortillas and (probably) turkey or duck eggs. 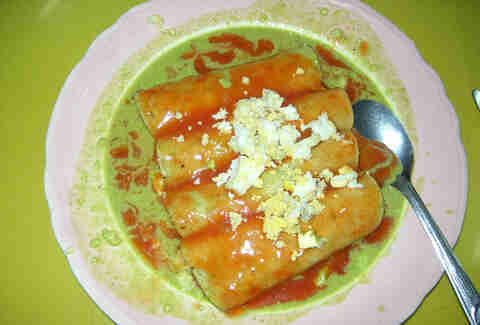 Today, papadzules are made of thinner tortillas which're dipped in a pumpkin seed-based sauce (just like back in the day), and filled with hard-boiled chicken eggs covered in a spicy tomato sauce. 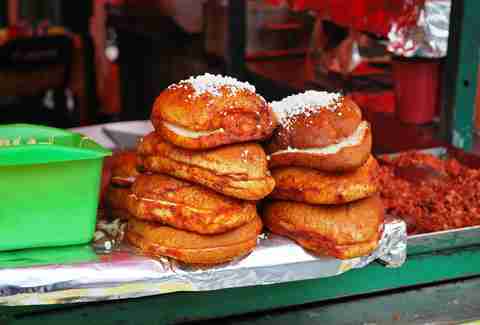 What it is: A pambazo is a unique type of Mexican bread that's not as crispy as what's used to make sandwiches like tortas and cemitas. Instead, it's a bit tougher and less malleable, which is the perfect consistency for what it goes through: It gets completely submerged in a guajillo pepper sauce, which is where it gets its red coloration (as Rick says: "This sandwich can make a Jack in the Box late-night menu!"). Then it's filled with chorizo and potatoes and sprinkled with queso fresco, just like you would be after a night in Tijuana. 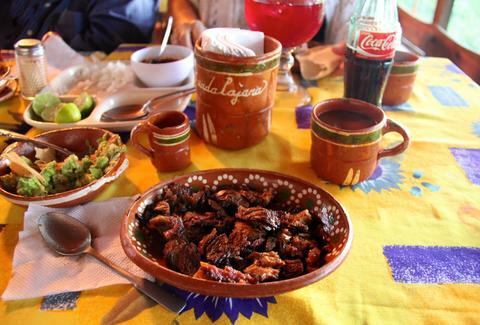 What it is: Humble tlacoyos, generally eaten as antojitos (which literally means "little cravings"), are fried, torpedo-shaped corn masa cake stuffed with pretty much whatever the heart desires, like beans, cheese, potatoes, and mushrooms. 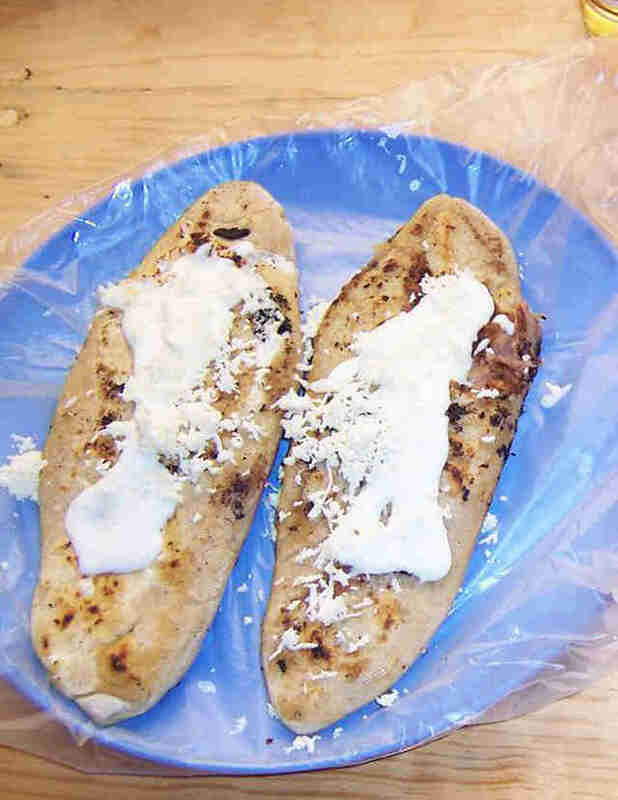 Since the dough used to make the tlacoyo is unsalted and dries out if not eaten after a while (and also comes in a wide variety of alluring colors, depending on which type of corn is used), they're a favorite of street vendors. 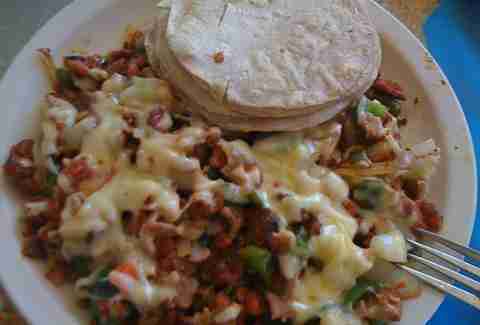 What it is: Imagine a Mexican cheesesteak: marinated, tender beef (or pork) chopped up and grilled with peppers and onions, before being covered in melted cheese and served with a stack of tortillas. The word "alambre" means "wire", indicating that the grilled meat involved in alambre is usually skewered and cooked over an open flame. Also, Omar probably loves it. What it is: This festive dish (which you can also see as the main image of this article) is a holiday staple, consisting of stewed lamb, goat, beef, or mutton. The broth it's cooked in is made of chili peppers, and usually seasoned with hints of cinnamon, cumin, and cloves -- and it can also be used as a filling for the familiar tortilla-y goodness that is the taco. And that brings us full circle. Adam Lapetina is a food/drink staff writer at Thrillist, and doesn't think you should order "an ice-cold birria". Read his musings on Twitter at @adamlapetina.